We hope that you had a good start of the new year. 2017 was a very eventful period for the ACP and its Tour. We would therefore like to inform you that the official final results of the Tour will be published on January 20. Please read our announcement and check whether you need to submit your results. Our General Assembly took place in December and you can see the results of the voting on our dedicated page. An established activity that we have every year is the awarding of the ACP Tournament of the Year title. As you already know, this is done via the votes cast by you, our members. This year the deadline for voting is January 15, so please take a few minutes to cast your vote if you haven’t done so already. Turning to our cooperation with various tournaments, January sees two big ones – the traditional (80th!) Tata Steel in Wijk aan Zee and the Tradewise Gibraltar Chess 2018. At the Dutch super-tournament ACP has 3 wild cards (GM Matlakov in the Masters, GM Gordievsky in the Challengers, as well as GM Krasenkow, who received the veteran’s spot in the Challengers). 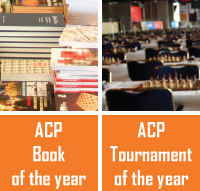 ACP Premiums also have special prizes on The Rock, courtesy of the Archibaldchess company that donated 5000 EUR. We use this opportunity to express our gratitude to the Archibaldchess company and GM Sergey Beshukov for supporting our cause. We have 5 wild cards in Gibraltar: GM Vitiugov, WGM Goryachkina, WGM Paethz, WGM Batsiashvili, and GM Khotenashvili. Our cooperation with the Chess.com Isle of Man International is confirmed. All the details can be found on our site where you can see that we will have 5 wild cards with 1500 GBP starting fee for this prestigious open. Another confirmed cooperation is with the traditional Poikovsky tournament. The ACP wild card will be determined by the ACP Tour standings as of April 1. The cooperation between ACP and ECU continues this year with special prizes for our Premiums at the European Individual Championship (March 16-29) in Batumi (Georgia) and European Women’s Individual Championship (April 7-20) in Vysoke Tatri (Slovakia). The special prizes in Batumi will be 6000 EUR (6 prizes of 1000 EUR each) while in Vysoke Tatri it will be 5000 EUR (5 prizes of 1000 EUR each). We will also have special prizes for ACP Premiums in the upcoming European ACP Women’s Rapid and Blitz Championship, to be held in Tbilisi (Georgia) March 29- April 2. The ACP donates 5000 EUR to this event and has also managed to secure conditions for no less than 8 ACP Premiums. We would also like to remind you to renew your ACP membership. You can do so by using our PayPal account paypal@chessprofessionals.org or via a bank transfer. Please see the details on our dedicated page. The ACP keeps working hard and we hope to deliver more good news soon!